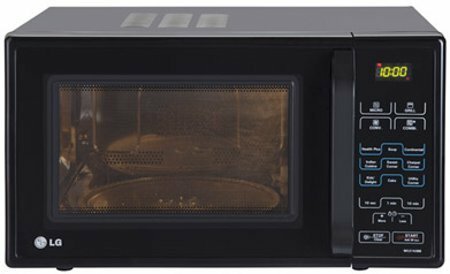 LG 21 L Convection Microwave Oven (MC2143CB, Black) comes with required accessories such as a glass tray, a rotating ring, a user manual and a cook book for all your cooking convenience. This LG microwave oven has a stainless steel cavity that is good for clear reflection and uniformity of heating inside the cavity for better even cooking. LG MC2143CB allows multi-function cooking (4 in 1). With a combination of four different cooking modes enables juicy and tasty results all the times. The four cooking modes are convection, grill, and solo and combination mode. Further, it has auto cook menu, you just need to prepare the ingredients, put them in the microwave and press the right button to enjoy your favorite recipe. This feature is really very good to enjoy your favorite Indian dishes at the touch of a button. LG MC2143CB microwave oven is powered by Intellowave Technology that ensures faster and healthier cooking by spreading microwaves evenly inside the oven interior.